“I’m slightly Christian” … Say what?! I’m always amazed when people in public places assume that everybody wants to hear their conversations, well that’s my assumption when I hear the volume they speak at. When it happens I always have the urge to join in and add my “tuppence worth” (two cents worth). It’s come close on a number of occasions, but the one that stands out happened recently during a time out for a cup of coffee. A middle aged couple were a table away from us, after fifteen minutes we knew their personal backgrounds; how many children they had between them, the fact their ex-husband/wife was at fault and the reason they now found themselves together, etc, etc. Then came this statement “You’ve got the measure of me, you know what I’m like, you know who I am … I’m slightly Christian.” Say what?! When I thought about it later I came to the conclusion that I guess countless people have a mental list of what they feel is acceptable moral and ethical behaviour, and think that by adhering to or doing the things on their checklist that it either qualifies them as Christian or at the very least “slightly Christian” and therefore acceptable to other people and perhaps even to God. But before we condemn or tut-tut or brand them as naive. 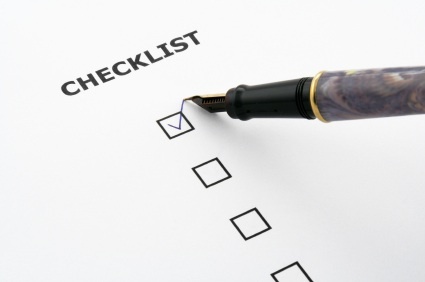 Think on this – Christians too create lists for themselves: spiritual checklists. They too think that by adhering to the things they think are expected of them this will make them acceptable to others, and it will mean that they will be okay with God. But the Christian life is about more than a checklist of moral, ethical and spiritual behaviour, and it’s certainly about more than getting a tick in the box.